We are all visual learners. We all have different learning styles, but a picture is worth a thousand words to us all. And that’s why Canva is a fantastic tool for learning. Educators can use it to present material to students in a visual manner, and students can use it to “articulate” new concepts in a clear and intuitive way. One of the best things about Canva is that it allows us to take visual learning to a new level: Students and teachers can become “design thinkers,” meaning we can become skilled at imagining and creating solutions to problems rather than identifying existing ones. Learning and teaching happen as we envision, create, share, and revise. All we need are the right tools for the job. Here are ten ways to use Canva in your classroom. “You can transform the world when you approach it with the goal of imagining and creating solutions,” write the creators of Design Thinking for Educators. Instead of teaching students to solve problems with existing solutions, let them experiment and innovate in order to stumble upon something better. The goal is to come up with more human-centered, collaborative, and optimistic ways to create social change—or at least to start thinking that way. You can also become a better educator by putting more effort into the “design aspect” of your lessons. For a little inspiration, get started with one of our design courses or articles on using design thinking in the classroom. Ask students to imagine solutions to problems by designing visuals in the style of this Making the World a Better Place Infographic or this Climate Change Infographic. One of the most powerful uses of Canva for Education is Lesson Plan creation. Whether you’re brainstorming teaching ideas, outlining a lesson plan, composing instructional text, creating lecture slides, designing visual aids, or simply experimenting with different ways to present concepts—Canva makes it easy to visualize and create effective lessons. Canva has over a million images and 65,000 layouts to choose from. Use an existing template or customize your own according to background, shape, font style, text content, and placement. Photos can be uploaded and edited without any pesky re-formatting issues. Interested in discovering what’s already out there? Need inspiration from someone who has covered your topic before? Canva makes it easy to collaborate with other educators, and for educators to share their lesson plans with the rest of the community. On our Teaching Materials page, you can find lesson plans written by other educators. Each lesson plan includes recommended learning objectives, instructions for preparation, suggested learning flow, and homework/extension activities. Peruse the teaching strategies of some of the education community’s leading experts. Check out how Apple Distinguished Educator Monica Burns uses Canva to help students connect math terms to the real world, how Everyday Classroom Matters host Vicki Davis uses Canva to help students learn about history by creating a historical figure fan page, and how Write About co-founder John Spencer uses Canva to help students identify flaws in graphical representations of data with his Extreme Graph Makeover lesson. Students can use Canva to design and create their own learning portfolios to better visualize and record their learning. Learning portfolios can help students in a number of ways: to keep a personal record of one’s learning throughout a class or several classes; to assess and reflect on their own learning process; or to refer to while deciding on a college major, creating a CV, or applying for a job. Teachers can use learning portfolios for assessment purposes, to involve parents in student learning, to help students become more aware of their own learning process--and, of course, to teach design skills. Students can adapt any of our personal page or resume templates, such as this Peach and White Floral Learning Portfolio template, to get started. Alternatively, they can create their own from scratch using their own background, font style, color scheme, and content layout. Canva is a fantastic resource for presentation and lecture slide creation. When you’re designing your next lesson plan, choose from thousands of templates to present new material in a colorful, engaging way. You can also take advantage of the Presentation Mode feature, which allows you to expand your design to fill your entire screen and navigate between slides with your keyboard’s left and right arrows. Activate this mode by pressing Ctrl, Shift, Enter; and exit this mode by pressing escape. If you want to share your presentation with students, you can do so in the form of an interactive website. When students click on your unique link URL, your design will open in website mode and they can navigate by scrolling between slides. Environment influences learning in countless ways, and you can use this to your advantage by consciously designing your classroom in a way that facilitates learning as much as possible. For example, you can use cheerful color schemes to sustain attention; design and print out motivational posters that reflect the course objectives; and create visual memory aids such as photo collages and banners that students will associate with specific concepts. Involve your students in the process, too. You will learn a lot about design simply by using Canva on your own, but we’ve got you covered with tutorials, workshops, and guides on branding basics—like the Design School Workshop on Branding Basics, shown below—in case you need further guidance. An educator’s job is to design student learning, but students are likely to be more motivated if we give them a chance to take learning into their own hands. It’s not enough to pass out a course syllabus at the beginning of the term; we need to encourage the act of creation so that students feel more involved in their own education. Ask students to create a “Learning Plan” that includes the course goals you’ve designed but also allows them to reflect on their own personal goals and connect them with yours--whether that means planning to spend extra time studying certain topics, test out different study methods for different subjects, or discover their passions and interests through self-assigned projects. The more aware students are of their own learning process, the better. Learning plans can be modeled after presentations, reports, magazines, newsletters, or any other layout style that suits your students’ needs. If you need some initial guidance, try out this colorful Learning Plan Template. Some students enjoy the interactive nature of group projects, and even learn better in groups, but more introverted or self-sufficient students might be a bit hesitant to learn this way. Canva addresses the needs of both kinds of student, since collaboration can happen in person, virtually, or a combination of both. Students can create a group of up to 10 members for free, which makes it easier to share designs and folders. They can share as many designs as they want in up to 2 folders within their group, which is ideal for drafting, revising, and collaborating on projects. They can also engage in peer review by liking, commenting on, and editing one another’s work. Many of Canva’s templates are already perfect for group projects. Students can collaborate on newsletters, reports, magazines, infographics, presentations, and more. Have students take a look at this Color Project School Photo Collage to get started. In addition to creating text-or-image-based graphics, students can use Canva to illustrate mathematical, statistical, and scientific concepts. Students who might otherwise hesitate to take on a “difficult” math project, for example, could find that they enjoy the creative aspect of a Canva assignment. Instead of modeling charts on graph paper, they can visualize quantities with colorful, meaningful designs. In Canva’s supply of data modeling templates, you’ll find everything from flow charts, Venn diagrams, strategy maps, and decision trees to comparison charts, bar graphs, and pie charts. And, of course, you can always adapt them to suit your assignment, or create your own template from scratch. Tired of worksheets that don’t quite fit your course objectives? Wish you could adapt an exercise or change the wording here and there? With Canva you can design and customize your own worksheets and exercises. 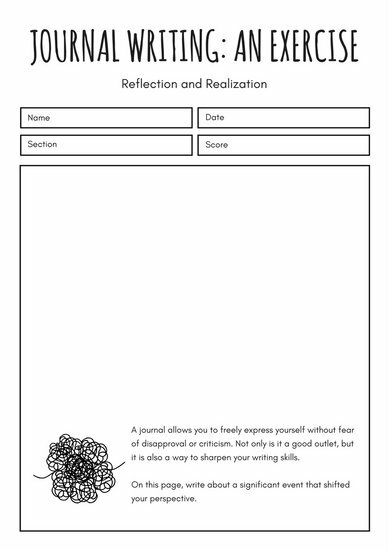 Build your own or choose from a range of existing templates, from writing prompt, journal entry, and book review designs to multiplication table, word problem, and science puzzle layouts. It’s also super easy to make copies of your worksheets and exercises: simply hit the “Copy this page” icon to the right of your design and Canva will instantly create another copy of it for you. 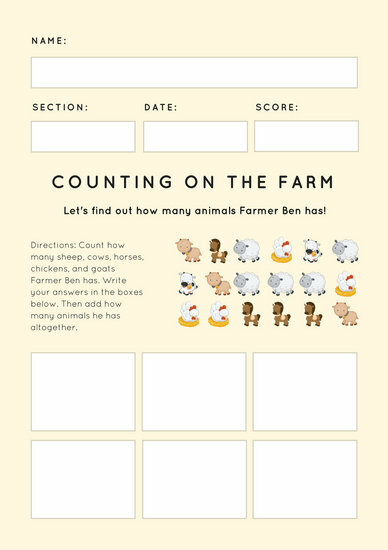 Check out this Cream Animal Addition Math Games Worksheet or this Journal Writing Exercise Template for inspiration. These are just a few of the countless ways you can use Canva in your classroom. Once you begin experimenting, you’ll get a feel for what works and what doesn’t when it comes to fulfilling course goals and meeting your instructional needs. You can then adapt your creative strategy as needed, and--best of all--share your discoveries with fellow educators to fill the rest of the community in on the many ways Canva can enhance teaching, facilitate learning, and transform any educational environment for the better.